Fire at Texas petrochemicals plant. Sarah Bloomquist reports during Action News at Noon on March 18, 2019. HOUSTON -- Emergency crews worked Monday to control a large fire burning at a Houston-area petrochemicals terminal that has spread to eight storage tanks. Firefighters used foam to battle the blaze, which started Sunday morning at Intercontinental Terminals Company in Deer Park, about 15 miles (24 kilometers) southeast of Houston. ITC said the risk of explosion is "minimal" but crews were working to further reduce the risk. All employees are accounted for and no injuries have been reported, ITC said. The fire spread overnight to a tank that contains a chemical used in nail polish remover, glues and paint thinner. Earlier, the fire spread to separate tanks that contained petrochemical liquids and gases, including fuel oil and bunker oil. 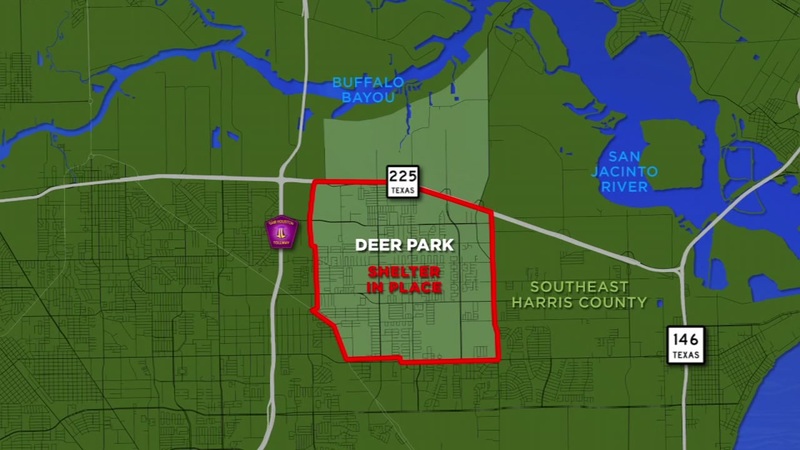 A shelter-in-place order that had been issued for residents of Deer Park was lifted early Monday morning after results of air quality tests showed no unsafe levels of chemicals, the city said. But city and county officials warned that smoke from the fire could cause skin and eye irritation and respiratory issues. Schools in the area were closed Monday as a precaution. A huge plume of smoke could be seen for miles, including from the Galveston Ferry , which is about 35 miles (55 kilometers) southeast of the blaze.